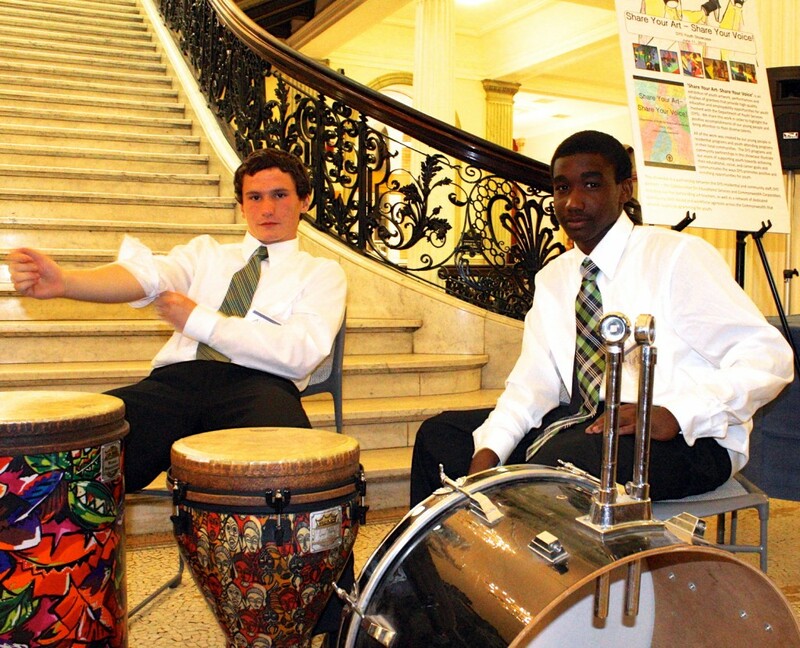 A student group led by ThisWorldMusic Founder Jeremy Cohen performed at the Massachusetts State House as part of the Department of Youth Services “Share Your Art – Share Your Voice!” showcase. With the 2nd Annual Massachusetts Department of Youth Services (DYS) “Share Your Art – Share Your Voice!” statewide showcase coming up on June 17th at UMass Boston, I thought I’d share some pictures from last year’s inaugural showcase. First, a little background: In 2006 the Massachusetts-based non-profit Collaborative for Educational Services (CES) initiated Unlocking the Light, an arts integration and professional development program designed to aid teachers working in Massachusetts DYS juvenile detention facilities. Supported by a federal grant from the Department of Education, the program combined classroom-based artist residences with professional development strategies that provided teachers with creative methods to engage DYS students with standards-based skills, such as literacy, numeracy, critical and reflective thinking. Federal funding for Unlocking the Light eventually ended, but the work has continued, in large part due to the incredible efforts of DYS, CES and the Commonwealth Corporation (CommCorp), as well as teaching artists throughout the state. Last year, the National Endowment of the Arts awarded a $60,000 grant to CES to expand art opportunities for incarcerated and court-involved youth in Massachusetts. In partnership with DYS and CommCorp, the Artists in Juvenile Justice Initiative is currently funding 4 organizations, including ThisWorldMusic, to bring performance, digital media, and visual arts to DYS classrooms around the state. At last year’s inaugural showcase, youth at facilities from around the state were given day passes (and snappy suits!) 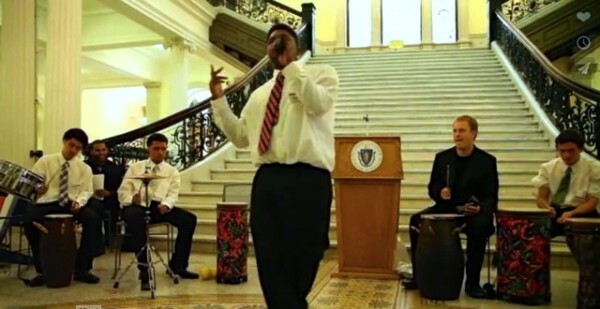 to travel to Boston and perform at the Massachusetts State House. In the shots below, a student hip-hop percussion ensemble accompanies a terrific young rapper for the assembled crowd. All music and lyrics were student-composed. 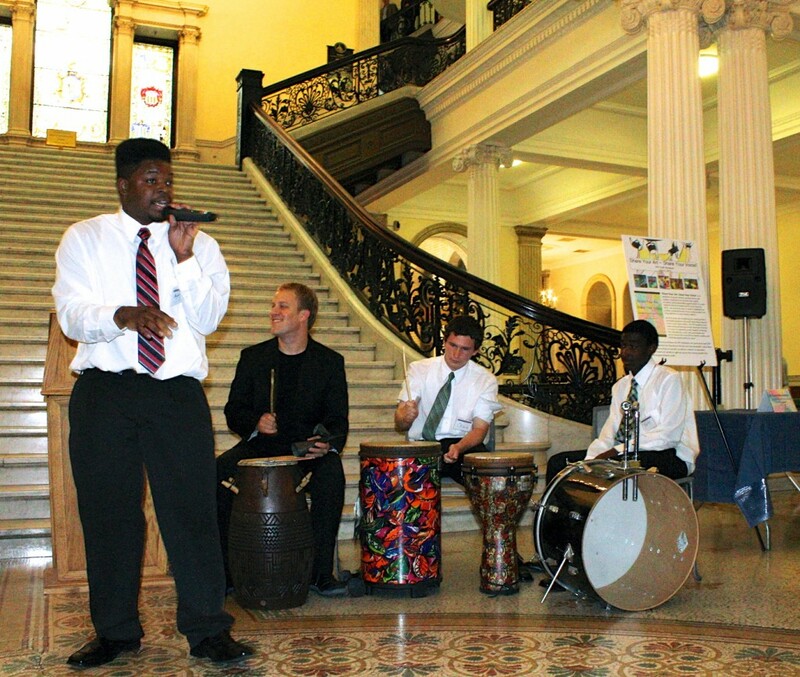 The showcase program featured a youth rapper accompanied by a live hip-hop drum ensemble. 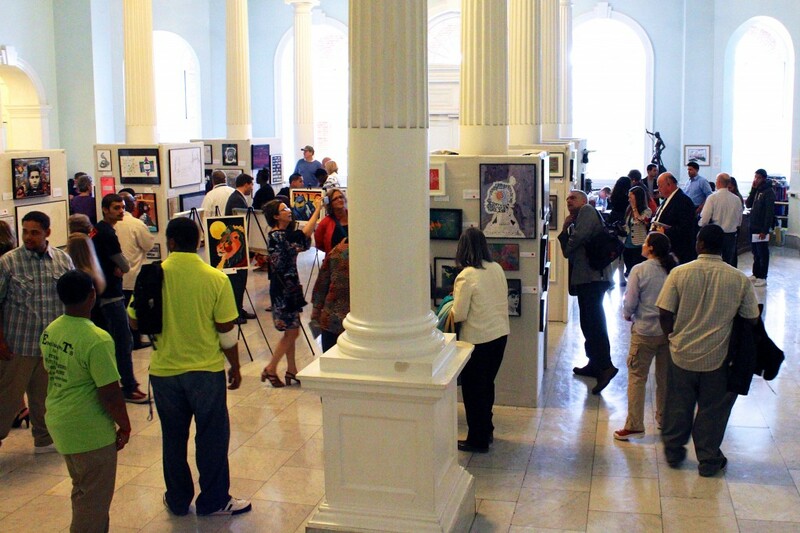 Original art work from youth at DYS facilities across the state was displayed for purchase. Youth performers relaxing on a break in front of the State House’s Grand Staircase.